Swipe it, CTRL + Z, Command + tab, long press on the Home button: Navigating on your computer and smartphone is a lot easier when you know a few essential shortcuts. I use to take for granted that everyone knew certain shortcuts, but whenever I would watch folks navigating on their devices, I would be reminded otherwise. I hope you find this guide really helpful and start using these shortcuts immediately. As with all of my tips, you aren't getting an exhaustive list of EVERY available shortcut out there. 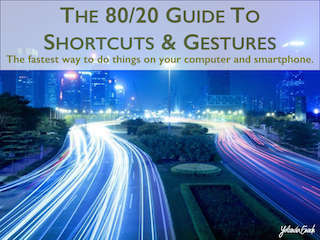 This Guide only covers the 20% of shortcuts that you’ll use 80% of the time. In addition to the download, you'll also receive periodic emails from me, containing information about upcoming classes and other tech tips to make managing your life easier. You can unsubscribe at anytime. What's your biggest frustration right now in regards to technology? It could be related to a specific smartphone app, software program, device, or a problem you’d like to solve using technology. Just hit reply and let me know (I read every email). P.S. Follow me on Twitter, Instagram, and YouTube…whatever’s your fancy for a more real-time conversation.